These homemade tasty treats are typically eaten for Easter. 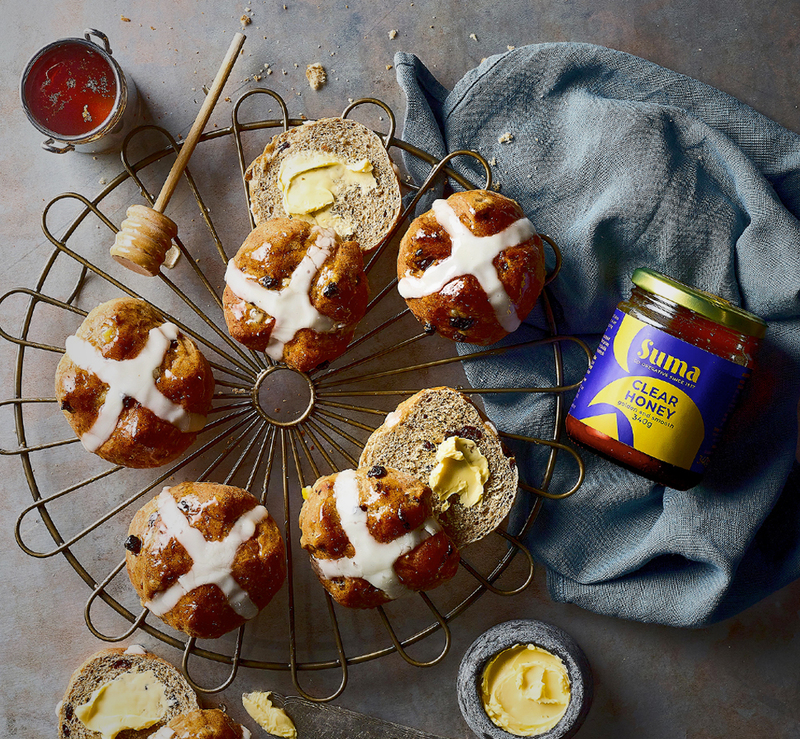 The buns are soft, sweet, gently spiced and fruity. You can make a vegan version easily if you replace the honey with rice syrup. Place half the flour and all the peel in a bowl. In a separate bowl place the yeast, oil, allspice, cinnamon and water. Leave until the yeast is active, i.e. bubbles appear on the surface. When the yeast is active add to the flour and peel. This will be a thick batter. Beat well. Leave batter mixture until it has doubled in size. When it has doubled in size add salt. We do not add salt before this stage because it kills the yeast. Beat the mixture well and slowly add the rest of the flour until you get a soft dough. This is important- the stiffer the dough, the heavier the buns and we are hoping to have light, soft hot cross buns. You may not need all of the flour- it depends on the absorbency. Shape the buns (50g of dough gives a good sized bun) and place on an oiled baking sheet. Place a pastry cross, cut a cross or pipe a choux pastry cross on the top and leave to rise. Heat oven to 250°C/450°F/gas mark 7. It is important that the buns are cooked in an oven at this temperature. When the buns have doubled in size, cook for 14 minutes in the hot oven. Upon taking them out of the oven glaze with honey or rice syrup. This recipe has been developed and adapted by Suma worker Holly (self-taught baker and ex-chef) from one that originally appeared in the Wholefood Easter Cookery book, a lovely pamphlet we have had in the Suma archive since 1982! It was written by The Wholefood Cookery School, Leicester.